These days, we’re all a bit more visual than ever. Tweets with images receive 18% more clicks, 89% more favorites and 150% more retweets. When it comes to your accounts, the same applies. Looking at a graphical display of your new customers going up, up, up – and then sharply down – impacts you far more than staring at thousands of little cells on a spreadsheet, and trying to discover which one goes where. 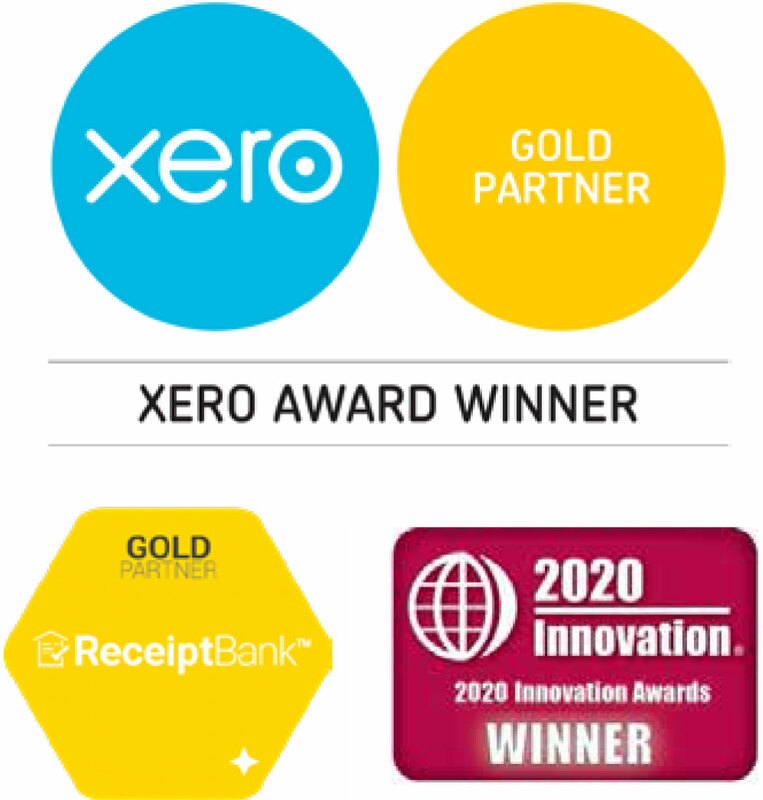 That’s why we use Spotlight to take the raw data straight from your Xero online accounting software, and display the key numbers in beautifully clear, graphical ways. This way you’re no longer blinded by numbers and can see the business wood hidden among the data trees. You can choose different charts, graphs and visual representations so your business information becomes more than just data – it becomes true business intelligence. Naturally you’ll still want an accountant to help you get these graphs right (we say this with all modesty), but once it’s set up and going, it’s up to you what you do with it. Keeping a keen eye on your financial performance is obviously one of your biggest concerns as a business owner. Understanding the health of your cash flow, and keeping on top of aged debts etc. will always be vital to meeting your profit targets. Integrate with Google Analytics so you have clear information on website statistics. How many people are visiting your website? Are they staying? Leaving? Buying? Ignoring? Measure your social media activity and responses so you can see how your following is growing (or shrinking). Display how many new customers you’ve signed up in the last month and understand the growth of your customer base. 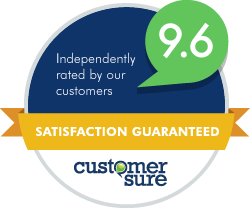 Set key performance indicators for any area of the business, whether it’s financial, online, social or customer relationship data. Naturally the Spotlight dashboards we use do all of this, and more. 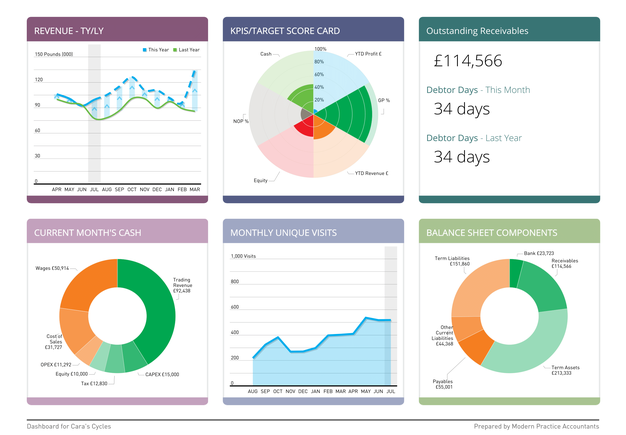 The core aim of the dashboard is to help you understand the current position of your business as easily as possible. But it’s also about measuring your performance over time, setting key targets and getting a better idea of how you’ll perform in the future. Resilience report: Want to know how your company is coping with the ongoing shifts and challenges in your market? Look at a resilience report to show you how well you’re bouncing back over time. Look over a target scorecard and a big score display to give you quick view of your business performance. The clear, visual target bars change colour depending on the business result and there’s even a section where we can add comments and analysis, to help you get more out of it. We’ve taken the power of the best dashboard, and added two other solutions to give you even more power to change. We call it the Xero Trifecta and it will become the real power behind your business – feel free to join us at our live event to see it live and in person!